Not to be confused with Wargame (hacking). The word "hackathon" is a portmanteau of the words "hack" and "marathon", where "hack" is used in the sense of exploratory programming, not its alternate meaning as a reference to computer crime. The term seems to have been created independently by both the developers of OpenBSD and the marketing team of Sun; these usages both first happened in 1999. OpenBSD's apparent first use of the term referred to a cryptographic development event held in Calgary on June 4, 1999, where 10 developers came together to avoid legal problems caused by export regulations of cryptographic software from the United States. Since then, a further 3-5 events per-year have occurred around the world to advance development, generally on University campuses. For Sun, the usage referred to an event at the JavaOne conference from June 15 to June 19, 1999; there John Gage challenged attendees to write a program in Java for the new Palm V using the infrared port to communicate with other Palm users and register it on the Internet. Hackathons typically start with one or more presentations about the event, as well as about the specific subject, if any. Then participants suggest ideas and form teams, based on individual interests and skills. Then the main work of the hackathon begins, which can last anywhere from several hours to several days. For hackathons that last 24 hours or longer, especially competitive ones, eating is often informal, with participants often subsisting on food like pizza and energy drinks. Sometimes sleeping is informal as well, with participants sleeping on-site with sleeping bags. At the end of hackathons, there is usually a series of demonstrations in which each group presents their results. There is sometimes a contest element as well, in which a panel of judges select the winning teams, and prizes are given. At many hackathons, the judges are made up of organizers and sponsors. At BarCamp-style hackathons, that are organized by the development community, such as iOSDevCamp, the judges are usually made up of peers and colleagues in the field. Such prizes are sometimes a substantial amount of money: a social gaming hackathon at the TechCrunch Disrupt conference offered $250,000 in funding to the winners, while a controversial 2013 hackathon run by Salesforce.com had a payout of $1 million to the winners, billed as the largest-ever prize. Some hackathons focus on a particular platform such as mobile apps, a desktop operating system, web development or video game development. Mobile app hackathons like Over the Air, held at Bletchley Park, England, can see a large amount of corporate sponsorship and interest. Music Hack Day, a hackathon for music-related software and hardware applications, is a popular event, having been held over 30 times around the world since 2009. Also Music Tech Fest, a three-day interdisciplinary festival for music ideas bringing together musicians with hackers, researchers and industry, features a hackathon. Similarly, Science Hack Day, a hackathon for making things with science, has been held over 45 times in over 15 countries around the world since 2010. Hackathons have been held to develop applications that run on various mobile device operating systems, such as Android, iOS and MeeGo. Hackathons have also been held to develop video-based applications and computer games. Hackathons where video games are developed are sometimes called game jams. "TV Hackfest" events have been held in both London and San Francisco, focusing mainly on social television and second screen technologies. In TV Hackfests, challenge briefs are typically submitted by content producers and brands, in the form of broadcast industry metadata or video content, while sponsors supply APIs, SDKs and pre-existing open source software code. Hackathons have also been used in the life sciences to advance the informatics infrastructure that supports research. The Open Bioinformatics Foundation ran two hackathons for its member projects in 2002 and 2003, and since 2010 has held 2-day "codefests" preceding its annual conference. The National Evolutionary Synthesis Center has co-organized and sponsored hackathons for evolutionary bioinformatics since 2006. BioHackathon is an annual event that started in 2008 targeted at advancing standards to enable interoperable bioinformatics tools and Web services. Neuroscientists have also used hackathons to bring developers and scientists together to address issues that range from focusing on a specific information system (e.g., Neurosynth Hackathon and the Allen Brain Atlas Hackathon) and providing reserved time for broad scientific inquiry (e.g., Brainhack), to using specific challenges that focus hacking activity (e.g., HBM Hackathon). Some hackathons focus on applications that make use of the application programming interface, or API, from a single company or data source. Open Hack, an event run publicly by Yahoo! 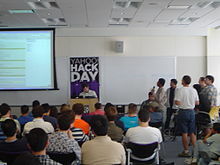 since 2006 (originally known as "Hack Day", then "Open Hack Day"), has focused on usage of the Yahoo! API, in addition to APIs of websites owned by Yahoo!, like Flickr. The company's Open Hack India event in 2012 had over 700 attendees. Google has run similar events for their APIs, as has the travel guide company Lonely Planet. The website Foursquare notably held a large, global hackathon in 2011, in which over 500 developers at over 30 sites around the world competed to create applications using the Foursquare API. A second Foursquare hackathon, in 2013, had around 200 developers. Developers at the 2011 Rewired State "National Hack the Government Day"
There have been a number of hackathons devoted to improving government, and specifically to the cause of open government. One such event, in 2011, was hosted by the United States Congress. Starting in 2012, NASA has been annually hosting the International Space Apps Challenge. In 2014, the British government and HackerNest ran DementiaHack, the world's first hackathon dedicated to improving the lives of people living with dementia and their caregivers. The series continues in 2015, adding the Canadian government and Facebook as major sponsors. The judging panel (seated, left) at DementiaHack asking questions of a team that just demoed their project (standing, right). NHS England benefit from a community of supporters running regular hackdays. These are planned 3 times a year are held in a variety of locations including London, Cardiff, Manchester, Oxford, leeds and Cambridge. The first NHS Hackday was held in London on May 26, 2012. With over 6,000 registrations in their first year, HackingEDU's hackathon, held in San Mateo, California, is the world's largest education hackathon by attendance on October 23, 2015. The event is run by a non-profit organization whose mission is to "inspire the next generation of students to solve the problems that plague our education system." The Global Game Jam, the largest video game development hackathon, often includes optional requirements called 'diversifiers' that aim to promote game accessibility and other causes. Various hackathons have been held to improve city transit systems. Hackathons aimed at improvements to city local services are increasing, with one of the London Councils (Hackney) creating a number of successful local solutions on a 2 Day Hackney-thon  There have also been a number of hackathons devoted to improving education, including Education Hack Day and on a smaller scale, looking specifically at the challenges of field work based geography education, the Field Studies Council hosted FSCHackday. Random Hacks of Kindness is another popular hackathon, devoted to disaster management and crisis response. Hackathons have also been held to benefit nonprofit organizations with their technology and website needs. For example, Florida DrupalCamp's Coding with a Cause, Chennai based non-profit Code 4 Cause, and Droplabs' Coders with a Cause  events both benefit local nonprofits. Hack for Big Choices is an organization that organizes hackathons around the world in order to come up with solutions to local problems. Among the hackathons they have co-organized was the largest hackathon ever held in Africa, which took place in Accra on February 20–22, 2015; it gathered 215 hackers and more than 400 attendees. A number of hackathons around the world have been planned in memory of computer programmer and internet activist Aaron Swartz, who died in 2013. Some hackathons are intended only for programmers within a certain demographic group, like teenagers, college students, or women. Hackathons at colleges have become increasingly popular, in the United States and elsewhere. These are usually annual or semiannual events that are open to college students at all universities. They are often competitive, with awards provided by the University or programming-related sponsors. Many of them are supported by the organization Major League Hacking, which was founded in 2013 to assist with the running of collegiate hackathons. PennApps at the University of Pennsylvania was the first student-run college hackathon; in 2015 it became the largest college hackathon with its 12th iteration hosting over 2000 people and offering over $60k in prizes. Other collegiate hackathons include HackMizzou at the University of Missouri - Columbia, LA Hacks at UCLA, HackPrinceton at Princeton University, HackDuke at Duke University, HackTX at the University of Texas at Austin, StudentHack at Manchester Metropolitan University, MHacks at the University of Michigan, Boilermake at Purdue University, Y-Hack at Yale University, HackMIT at the Massachusetts Institute of Technology, HackIllinois at the University of Illinois at Urbana-Champaign, Hacktech at the California Institute of Technology, and WildHacks at Northwestern University. There are also hackathons at the high school level. These include a handful being organised in the United States - such as CodeDay, which consists of a set of hackathons across the Nation, and DCHacks, the largest high school hackathon on the East Coast - as well as India, where a hackathon started by a high school junior from Odisha in 2015, HackDAV, became the first hackathon for high school students in India. HackDAV held its first edition, organised in collaboration with the Google Developers Group of Bhubaneswar, in the founder's school, D.A.V. Public School, Pokhariput, Bhubaneswar and received its funding from numerous Universities in the state and companies abroad, like codeanywhere. Some companies, such as Netflix, Syntel, Cognizant, Facebook, Amazon, Google, SendGrid, Microsoft, Hewlett Packard , Pegasystems and Kareo, hold internal hackathons to promote new product innovation by the engineering staff. For example, Facebook's Like button was conceived as part of a hackathon. In some hackathons, all work is based around improving a single application, such as an operating system, programming language, or content management system. Such events are often known as "sprints" or "code sprints", and they are especially popular for open source software projects, where sprints or hackathons are sometimes the only opportunity for developers to meet face-to-face. Unlike other hackathons, these events rarely include a competitive element. The annual hackathon to work on the operating system OpenBSD, held since 1999, is one such event; it was a pioneering hackathon that may have originated the word "hackathon". Programming languages that have had such hackathons include Perl (for both development and QA), Haskell Scala and the PyPy interpreter for Python. LibreOffice, Drupal and MediaWiki are other applications that hold development hackathons. A hackathon in the Illawarra region of Australia named Hackagong was started in 2012. It was founded by students of the university of Wollongong to ignite the local tech startup culture and contribute to local economy. In 2013 it featured a 3D printing competition which may have been the first of its kind in Australia. Some hackathons are created for students that are newer to programming, such as CodeDay, a 24-hour hackathon in 27 cities across the United States geared towards beginner and intermediate students. "Beginner" hackathons usually have interactive workshops on several topics such as iOS development, video game development, web development, basic programming, and perhaps even design principles. Some hackathons have no restrictions on content or attendees, and are simply a gathering to generate interesting software applications quickly. SAPO Codebits, sponsored by the Portuguese internet service provider SAPO, is one example. A team at the September 2013 TechCrunch Disrupt Hackathon presented the TitStare app, which allowed users to post and view pictures of men staring at people's cleavage. TechCrunch issued an apology later that day. A November 2013 hackathon run by Salesforce.com, billed as having the largest-ever grand prize at $1 million, was accused of impropriety after it emerged that the winning entrants, a two-person startup called Upshot, had been developing the technology that they demoed for over a year, and that one of the two was a former Salesforce employee. Major League Hacking expelled a pair of hackers from the September 2015 hackathon Hack the North at the University of Waterloo for making jokes that were interpreted as bomb threats, leading many hackers to criticize the organization. As a result of the controversy, Victor Vucicevich resigned from the Hack the North organizing team. ^ "OpenBSD Hackathons". OpenBSD. Retrieved 2015-04-10. ^ a b Biddle, Sam (November 22, 2013). "The "Biggest Hackathon Prize In History" Was Won By Cheaters". Valleywag. ^ Williams, Alex (November 21, 2013). "Two Harvard University Alum Win Disputed Salesforce $1M Hackathon Prize At Dreamforce [Updated]". TechCrunch. ^ "Music Hack Day homepage". Musichackday.org. Retrieved 2013-10-09. ^ "Music Hackathon at Music Tech Fest in Boston". BBC.com. Retrieved 2015-03-05. ^ "Science Hack Day homepage". Sciencehackday.org. Retrieved 2014-12-09. ^ "Android Hackathon". Android Hackathon. 2010-03-13. Retrieved 2013-10-09. ^ "iOSDevCamp 2011 Hackathon". Iosdevcamp.org. Retrieved 2013-10-09. ^ "N9 Hackathon" (in German). Metalab.at. Retrieved 2013-10-09. ^ "Nordeus 2011 Game Development Hackathon". Seehub.me. Retrieved 2013-10-09. ^ "TV Hackfest homepage". Hackfest.tv. Retrieved 2013-10-09. ^ "Article on TV Hackfest San Francisco". Techzone360.com. 2012-12-19. Retrieved 2013-10-09. ^ "PDF of Feature article on TV Hackfest in AIB The Channel" (PDF). Retrieved 2013-10-09. ^ "OBF Hackathons". Open-bio.org. 2013-03-12. Retrieved 2013-10-09. ^ "NESCent-sponsored Hackathons". Informatics.nescent.org. Retrieved 2013-10-09. ^ T Hill (2007-12-14). "Hilmar Lapp, Sendu Bala, James P. Balhoff, Amy Bouck, Naohisa Goto, Mark Holder, Richard Holland, et al. 2007. "The 2006 NESCent Phyloinformatics Hackathon: A Field Report." Evolutionary Bioinformatics Online 3: 287–296". La-press.com. Retrieved 2013-10-09. ^ "biohackathon.org". biohackathon.org. Retrieved 2013-10-09. ^ "hackathon.neurosynth.org". hackathon.neurosynth.org. Retrieved 2013-10-09. ^ "2012 Allen Brain Atlas Hackathon - Hackathon - Allen Brain Atlas User Community". Community.brain-map.org. 2012-09-04. Retrieved 2013-10-09. ^ "Brainhack.org". Brainhack.org. Retrieved 2013-10-09. ^ "HBM Hackathon - Organization for Human Brain Mapping". Humanbrainmapping.org. Retrieved 2013-10-09. ^ "Pune Rails Hackathon: July 29-30, 2006". Punehackathon.pbworks.com. Retrieved 2013-10-09. ^ "Google Hackathon • Vivacity 2015". Vivacity. 2014-12-25. Retrieved 2015-01-10. ^ "Melbourne Hack Day: List Of Presentations And Winners". Archived from the original on 2011-04-22. ^ "DementiaHack - HackerNest". Retrieved 2015-09-03. ^ "HackingEDU Registration Report". Typeform. Retrieved 13 October 2015. ^ "HackingEDU Official Website". HackingEDU. Retrieved 13 October 2015. ^ "About the Global Game Jam". GlobalGameJam. Retrieved 19 April 2016. ^ "Global Game Jam Diversifiers". GlobalGameJam. Retrieved 19 April 2016. ^ a b Scott, Michael; Ghinea, Gheorghita (14 May 2013). Promoting Game Accessibility: Experiencing an Induction on Inclusive Design Practice at the Global Games Jam (pdf). Proceedings of the Inaugural Workshop on the Global Games Jam. Society for Advancing the Study of Digital Games. pp. 17–20. doi:10.13140/RG.2.1.5193.6481. Retrieved January 1, 2016. ^ a b Scott, Michael; Ghinea, Gheorghita (22 October 2014). Promoting Inclusive Design Practices at the Global Game Jam: A Pilot Evaluation (pdf). Proceedings of the 2014 IEEE Frontiers in Education Conference. IEEE. pp. 1–4. doi:10.1109/FIE.2014.7044162. Retrieved January 1, 2016. ^ "Hackney Hackathon succeeds in new services". Retrieved 17 July 2015. ^ "Education Hack Day". Education Hack Day. Retrieved 2013-10-09. ^ "fschackday.org". fschackday.org. Retrieved 2013-10-09. ^ "Coders with a Cause". Retrieved 8 August 2014. ^ Rocheleau, Matt. "In Aaron Swartz' memory, hackathons to be held across globe, including at MIT, next month". Boston Globe. Retrieved 17 October 2013. ^ Doctorow, Cory. "Aaron Swartz hackathon". Boing Boing. Retrieved 17 October 2013. ^ Sifry, Micah L. "techPresident". Personal Democracy Media. Retrieved 11 October 2013. ^ "Aaron Swartz Hackathon". Retrieved 30 October 2013. ^ "Hackathons at Duke". Retrieved 2 March 2015. ^ "PennApps". PennApps. Retrieved 31 October 2013. ^ "MHacks". MHacks. Retrieved 31 October 2013. ^ "HackIllinois". CS @ Illinois. Retrieved 3 November 2014. ^ "HackDAV". www.hackdav2015.tk. Retrieved 2016-08-10. ^ "The Netflix Tech Blog: Netflix Hack Day - Autumn 2015". techblog.netflix.com. Retrieved 2015-11-18. ^ "Welcome to the First European Perl Hackathon". Conferences.yapceurope.org. 2007-03-04. Retrieved 2013-10-09. ^ "Hac: The Haskell Hackathon". Haskell.org. 2013-06-30. Retrieved 2013-10-09. ^ "The International Scala Hackathon". Scalathon. Retrieved 2013-10-09. ^ "LibreOffice Events". The Document Foundation. 2014-07-11. Retrieved 2014-07-11. ^ "Drupal NYC Hackathon". Groups.drupal.org. 2009-08-16. Retrieved 2013-10-09. ^ "MediaWiki Events". Mediawiki.org. Retrieved 2013-10-09. ^ "Hackagong to boost tech start-ups in city". illawarramercury.com.au. 2013-07-08. Retrieved 2014-06-10. ^ "Meet 'Titstare,' the Tech World's Latest 'Joke' from the Minds of Brogrammers". The Wire. Retrieved 2015-11-09. ^ "An Apology From". TechCrunch. Retrieved 2015-11-09. ^ Mike Swift. "When Jokes go too Far.". Major League Hacking. Retrieved 2016-06-06. ^ Victor Vucicevich. "Leaving Hack the North". Medium. Retrieved 2016-06-06. 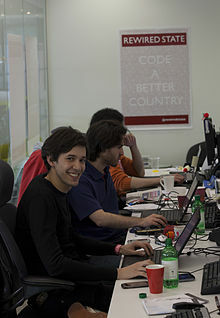 Wikimedia Commons has media related to Hackathon. This page was last modified on 20 September 2016, at 18:15.